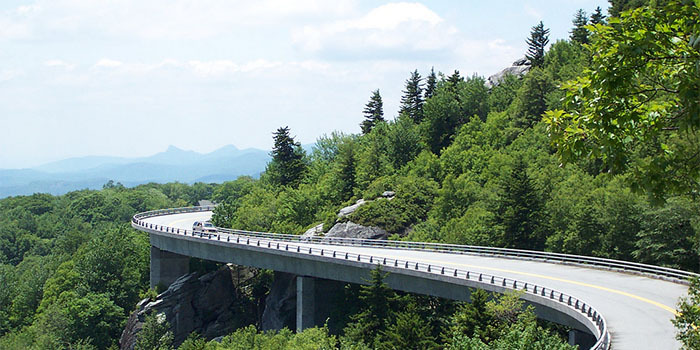 North Carolina’s High Country — composed of six mountain counties — is such a well-known tourist destination you might think you’ve seen all there is to see there. But if you’ve spent any time in the area, you know it’s more gravel road than beaten path. Here, we reveal twenty of the High Country’s best-kept secrets to reintroduce you to a region you thought you already knew. You’ve probably heard of river tubes, but what about river tubs? Foothills Outdoor Adventures will put groups of 4-8 in a tub on the Yadkin River for pick up a few hours downstream. The tubs, which resemble gigantic kiddie pools, are private islands large enough for coolers, lawn chairs, and even accompanying pets. Animal lovers can assist in the care of Grandfather Mountain’s beloved bears and otters through this program, available to guests 12 and over. Participants help keepers maintain habitats and feed animals, while getting to know the resident creatures’ distinctive personalities. Reservations must be made at least a week in advance and are limited to two people per day. Virginia is famed for the 17-mile bike trail that runs its leg of the former Virginia-Carolina railroad bed, but few people know that the town of Lansing is preserving their section of the historic route. The Lansing Creeper Trail Park’s bike trail is only a half-mile long, but it’s slated for expansion and offers visitors the opportunity to view history from the Carolina side of the tracks. There are numerous, child-geared flume mining operations in the High Country. But Gem Mountain additionally offers adult-size adventures for rock hounds. Guides will lead you over rugged terrain and into the historic Hoot Owl Mine, where they’ll teach you how to use pneumatic tools as you search for precious stones in raw wilderness. The Southern Appalachian Historical Association founded this museum in 1980. It features a collection of cabins dating back to 1785. Here, in the warmer seasons, reenactors often engage in tomahawk-throwing contests and casually cook venison over open fires. Private parties can pre-arrange workshops on how to make pioneer crafts including cornhusk dolls and dipped candles. F.A.R.M. (Feed All Regardless of Means) Café, located in downtown Boone, works on a donation system, and its charitable philosophy is put to work in the organic garden it runs in Valle Crucis. The site attracts curious gardeners from across the country. If you stop by after a visit to the adjacent Mast General Store, you might find a volunteer plowing the field with his horses or be directed to baby swallows nesting in a nearby barn. The emerald forests of Beech Mountain once inspired a Wizard of Oz-themed amusement park. Now, they draw mountain bikers to more than 8 miles of single- and double-track trails. The competitive biking trails have a view from 5,400 feet, and they’re free and open to the public. For a fee, the town’s ski lifts will even carry bikers and their equipment to the summit in preparation for a ripping-roaring return ride. This whimsical amusement park closed its gates in 1980, but it opens once a year for an Autumn at Oz party. It’s also possible to rent the park for special occasions, including weddings. Rental costumes are available onsite, and more than a few visitors have been spotted wearing ruby slippers on the park’s bona-fide yellow brick road. This free event, held annually, gives locals and visitors a chance to experience what it might be like to be an artist-in-residence at Penland School of Crafts. Each year, roughly 100 creative volunteers gather to help guests sculpt clay into pots, hammer iron into garden stakes, and craft glass into paperweights. The tale of Tom Dula, who murdered his fiancée, proliferates in western North Carolina. But the story of Charlie Silver, murdered in 1831 by his young wife, is just as horrifying and has been relayed in a mountain ballad and Sharon McCrumb novel. The museum is open to visitors on the fourth Saturday of each July, a date set to coincide with the annual Silver Family Reunion. The Orchard at Altapass is a regional favorite for apple picking, but it’s also a leader in preserving pollinators. Here, monarch butterflies are raised in terrariums on the grounds, which feature larval milkweed plants. The Orchard offers educational programs and even milkweed seeds for visitors interested in helping monarchs find their way to and from North Carolina as they migrate across North America each year. Allegheny County might not produce as much tobacco as it once did, but it’s still home to the largest craftsman pipe manufacturer in the world. Dr. Grabow Pipes have been produced in Sparta since 1943, and the brand’s factory lobby–operating as International Pipes & Accessories–now doubles as a for-sale pipe gallery. Company representatives have discovered that even non-smokers enjoy spontaneously touring the workshop in back. The flora of the New River valley attracts birds uncommon in other parts of the state. Spend an afternoon floating the New River, or just relaxing on its banks, while keeping an eye out for scarlet tanagers, indigo buntings, and golden-winged warblers, among other species. Even if you’re not a serious birder, it’s hard to imagine you’d be disappointed by the sight of an osprey spreading its wide wings. Grapestompers, in Laurel Springs, has been supplying home winemakers with equipment since 1998. Every summer, they invite amateurs who’ve toiled away on signature bottles to come out for their annual Home Winemaker Festival. Members of the general public are invited for tastings and information on how they, too, can turn personal kitchens into miniature wineries. Envision the memorabilia collections of all the train enthusiasts you’ve ever known, add that to every train-model-stocking toy store you’ve ever been in, and you’ll have an idea of what it looks like inside Black Cat Station. Members of the Yadkin Valley Chapter of the National Railway Historical Society have been building their working train collection in a repurposed service station since 2006. Visitors are invited to admire the results on the second Saturday of each month. While the downstairs of this High Country landmark is home to the Southern Highland Handicraft Guild, the upstairs is usually off limits for visitors. But summer through fall, you can sneak a behind-the-scenes peek by joining a National Park Service ranger for a 40-minute tour through the Cone family’s historic living quarters. The tours, held Saturday and Sunday only, require reservations. Contact the National Park Service after 9 a.m. the Friday before the weekend you’d like to attend. Crooning isn’t often paired with coffee, but every second Friday of the month starting at 7 a.m., early risers crowd this pawn shop to see a live performance that’s broadcast on local radio station WKBC. Musical guests have included the Grammy-winning Tut Taylor, the Kruger Brothers, and Rhonda Vincent. The wild things that come out of the Elkland Art Center seem to have leapt from the pages of a Maurice Sendak book. This community enterprise features many offerings, but its main focus is puppet parades, and it instructs artists of all ages in creating larger-than-life characters out of found and recycled materials. Elkland’s largest event is a Fourth of July Parade in Todd, and it must be seen to be believed. These Sunday Salons offer conversation and creativity as River House guests linger with visiting artists, writers, and musicians on the banks of the New River in rural Ashe County. Hors d’oeuvres and dinner are served as part of the program. If you attend and haven’t reserved a room to retreat to after the evening’s festivities, you’ll probably wish you had. Once a month, on varying weekends, the Todd Mercantile hosts an old-time contra dance. Friends and strangers alike waltz, square dance, flat foot, and clog together under the tutelage of a professional caller. Admission is $5 and the party lasts about three hours.